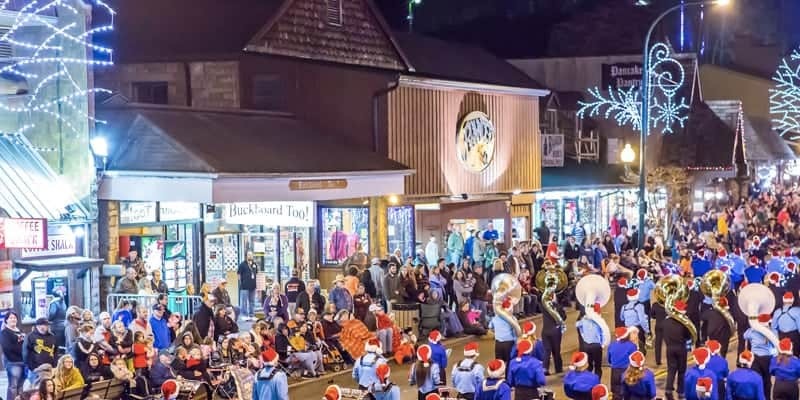 The biggest celebration in Gatlinburg is the annual New Years Eve Ball Drop and Fireworks show at the Gatlinburg Space Needle. Gather around the intersection of Parkway and Historic Trail to countdown to midnight and enjoy a magnificent fireworks display! The fireworks will blast off the rooftop of the 400 foot tall Space Needle with special music that has been choreographed for the show. The Space Needle has even added rhythmic LED lights to the tower to make the display even more spectacular! Enjoy breathtaking views and a delicious buffet with the New Year’s Eve Celebration at Anakeesta! This is the perfect location to watch the fireworks display above downtown Gatlinburg as the clock strikes midnight! This fun event features an incredible buffet at the Cliff Top Grill & Bar with slow roasted prime rib, shrimp scampi skewers, a vegetable medley, desserts and more! You will also have the opportunity to win raffle prizes, listen to live music and enjoy a champagne toast! Another great way to celebrate New Year’s Eve in Gatlinburg is with a wonderful meal, and one of the best places in town is the Melting Pot! This popular fondue restaurant features a set menu on New Year’s Eve with your choice of entree, cheddar fondue, California salad, and white chocolate crème brulee! If you are dining after 9:30 p.m., you can enjoy a premium table with party favors, midnight champagne toast and a partial view of the ball drop at the Gatlinburg Space Needle. If you are planning to attend the fireworks display after your meal, you will be happy to know that the Space Needle is just a two-minute walk away! For those couples who prefer to spend New Year’s Eve in Gatlinburg in a more private setting, there is nothing better than the Spa King Suites at the Old Creek Lodge! These wonderful suites feature a lovely gas fireplace that helps to create a warm romantic ambiance throughout the room. As if that doesn’t sound good enough, our Spa King Suites have a bubbling 2 person whirlpool that feels absolutely delightful! You will also love our many other room amenities such as a microwave, refrigerator, walk-in tile shower, and a private balcony. Check out all of our hotel rooms in Gatlinburg TN today to make your plans to celebrate New Year’s Eve in Gatlinburg! We look forward to seeing you soon at the Old Creek Lodge!